It is also wonderful for digestive issues. Pimento Berry Essential Oil is carminative. It has been found to be helpful with flatulence and indigestion as well as stomach cramps and spasms. 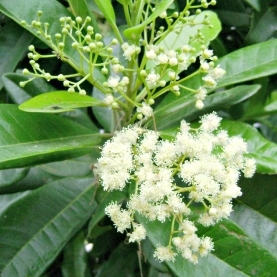 It is also known to be antiseptic and protective against infections in wounds and cuts. The pimento berry tree is classified as an evergreen shrub. This tree can reach 10–18 m (33–59 ft) in height. It can be a small, scrubby tree, quite similar to the bay laurel in size and form. It can also be a tall, canopy tree, sometimes grown to provide shade for coffee trees planted underneath it. Energetically this oil is supportive of the 2nd chakra, alleviates apathy and depression. Fosters strength and directness when needed in a balanced kind way. Assists in a state of mind of wholeness and completion. Pinto Berry aka allspice is warming to the four bodies - Physical, Emotional, Mental and Spiritual. Think of a cup of spiced cider on a cold winter's night. That is the comfort and support of allspice. According to Tisserand & Young, Pimento Berry Essential Oil may (oral usage) inhibit blood clotting, cause drug interactions, cause skin & mucous membrane sensitization. Contraindications: May interact with pethidine, MAOIs or SSRIs, anticoagulant medication, major surgery, peptic ulcer, hemophilia & other bleeding disorders. Oils high in eugenol, thymol or carvacrol inhibits platelet aggregation, and are not to be used by people with blood clotting disorders, by people taking anticoagulant drugs such as aspirin or Warfarin, or before surgery.